Even though it may seem that link building practice is no more relevant in today’s world, the truth is, SEO link building services are still needed in today’s digital space. Perhaps the term ‘link building’ is replaced with modern age jargons like link baits and natural links or organic links. However, the concept remains the same. It involves getting more traffic for your website by sharing relevant content on different platforms and linking it back to your website. Unlike black-hat SEO, white label SEO service providers know why building links are still relevant today and how important it is for increasing a business value. They also know that link building requires time and the results don’t show up overnight. It is indeed a time-consuming and a long-term process that requires continuous efforts. Google ranking is based on the number of external links that you receive for your website. Some of the top SEO experts say that these external links are an invaluable source for ranking your business higher in Google’s search engine. The external links with good anchor text receive a higher ranking. Links should contain anchor text pertaining to one’s site and also optimized according to SEO. Links should come from high authority pages or websites. The external links that you receive on your site should come from a page that has a reputable source of information or market-leading enterprise. Apart from ranking on Google’s pages, there few more scopes of growing your business through link building. One of them is nurturing a professional relationship with your clients, customers, and industry professionals. It is all about maintaining a healthy relationship with people who are directly related to your business, provided you are not link spamming. This helps both the parties to grow together by sharing good piece of information and building links through it. Links from high authority pages or websites pointing towards your website show that you are a reputed firm. This helps in gaining trust from customers and clients for better opportunities. A sense of trust and faith is developed amongst your audience which surely helps your business grow substantially. Building reputation is a slow process and you have to look into every single opportunity worthwhile. Quality Link building is surely a good way of doing it. Imagine a scenario in which you are making a relevant and informative comment on a great blog post directing towards your website. The readers viewing your comment will definitely link back towards your website. A plus point here is that you get required traffic from your business niche. Unlike artificial link building tactics that serve no fruitful purpose, generating traffic through organic search and results goes a long way. It is quite a known fact that Google keeps on updating its algorithms and techniques frequently for better user experience. From the past few years, Google has stressed upon promoting relevant content that is of genuine value to prevent unnatural linking patterns. This means, businesses need to be more cautious while sharing links. Modern link building process takes key factors like relevancy, legitimacy, and quality into account. Since 2017, the SEO best practices suggest building links for quality and not quantity. This clearly means that unlike in the past where marketers were able to host their links on as many sites as possible, now they will not be able to do so. Only few quality links having more value will make up to it. This is good news for those reputed brands and businesses who work really hard for getting quality links over quantity. It is clear that link building process is still relevant in this modern digital space. The only thing that has changed is the way link building works. Buying unnatural links is of no use in present time. Instead spare time for sharing quality content and start earning those few high authority backlinks. Businesses need to offer purpose and value to their audience for gaining success. 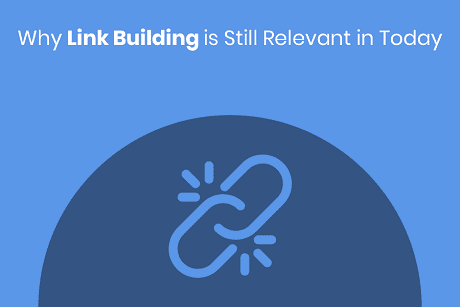 Do you also think that link building is relevant in present day? If not, why so? Mention your thoughts in the comment section. Couldn’t agree more with this Dharmik. While links may no longer be one of the major ranking factor as before, they are still crucial. In fact, if two pages are neck-to-neck in every other ranking factors, the one with just one external link pointing to it will rank higher.